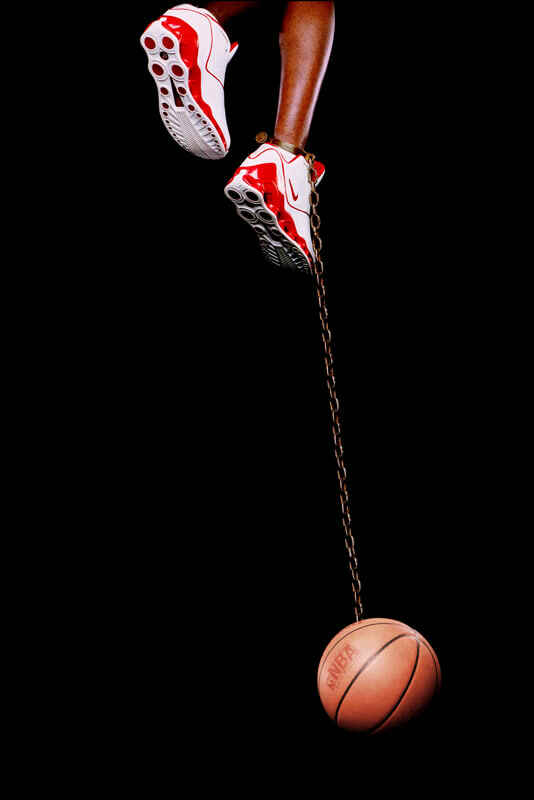 Hank Willis Thomas, Basketball and Chain, 2003. Digital C-print, Ed. 2/3, 99 x 55 inches. Rubell Family Collection, Miami. In his B®ANDED series, Hank Willis Thomas appropriates the language of advertising to highlight issues of race, representation, consumerism, and identity. In this way his work is about large ideas of society and culture, but it is also very personal—coming directly out experience of losing his cousin, who was killed because he was with someone wearing a gold chain. Thomas’s work twists well-known imagery to explore the impact of consumer culture on African-Americans, and how the bodies of black athletes and celebrities are exploited for profit. In Branded Head, the iconic Nike “swoosh” logo becomes inseparable from its human vehicle, its form becoming a permanent scar and evoking the branded skin of a slave. His work teases out the powerful cultural irony in which the black male body is a figure that is at both idealized and demonized.